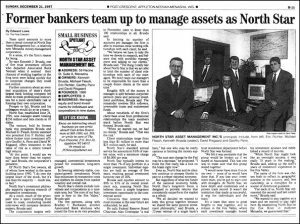 Prior to the establishment of North Star Asset Management, our five founding principals worked as a team of Trust Investment Officers at Associated Bank in Neenah, Wisconsin. Our success, as evidenced by our assets under management growth from $0 in 1996 to over $1 billion today, has been a product of our experience, continuity, and commitment. Those same principals continue to drive our business today. North Star Asset Management, Inc.